People are approaching their meals differently and McD's is paying the price. The most recent study from the American Customer Service Index shows that McDonald’s is America’s least favorite fast-food chain. For the report, the organization, which measures customer satisfaction in a number of industries, finds that the average customer satisfaction rating is 80 out of 100. Pizza Hut and Papa John’s are two of the few chains that scored the average. Burger King and Taco Bell were below the average (76 and 72 scores respectively). And McDonald’s comes in last with 71. Also noticeable from the chart: a number of fast-food chains scored below average. Many more this year than last actually. But when you talk about fast food in America, it’s McDonald’s that’s synonymous. That’s where larger trends become key factors. By and large, people dining at McDonald’s have limited expectations for customer service. We know the drive-thru mikes are garbled and never work properly. We just want someone to come by with that mop/rag dipped in gray water to keep things relatively clean. But the fries! Oh, we just can’t quit them. Still, McDonald’s sales numbers have been slipping lately. People are eating a little more healthy, such that you have chains like Subway getting pressured into removing an additive also found in yoga mats from its bread. Panera Bread is voluntarily removing additives, and Anheuser-Busch was pushed into revealing its recipe. 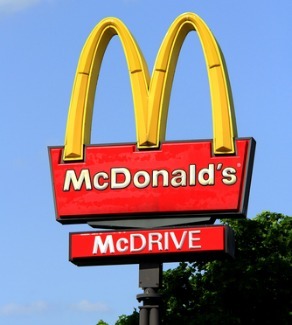 Consumers care more about the food they eat, and McDonald’s isn’t part of a healthy diet. To that end, The Huffington Post notes that more people are opting for “higher quality meals” at places like Outback Steakhouse and Olive Garden. When you can get a steak or a plate of pasta and shrimp for about the same price as a Big Mac meal, why not right? HuffPo also notes that as the economy improves and more people get back to work, they’re more willing to spend a couple extra bucks when they eat out. So in this case, it’s not entirely just your run-of-the-mill anti-McD’s voting here. There are some food trends that are at work here as well. Concern over the minimum wage issue and worker treatment is even playing into this. Subway right now has an ad that addresses the issue with its bread head on. We’ll probably start seeing more marketing like this, with fast food chains talking up the quality of their food and their working conditions more often to bring up these scores.